1. Which products you still keep buying more of despite having plenty in your collection? I think my makeup shopping was quite well-balanced last year, but I still bought more lippies than anything else. Lip products turn and go bad after time, and I do reapply them during the day unlike the other stuff, so I feel fine with this. Plus I am going through a transition. I used to only wear lip gloss, but now I'm into sheer lipsticks, stains, and those hybrid things. Kind of need to upgrade my lip wardrobes. This is just terrible. What kind of question is this??! There is no way I can come up with just one product. I like the color offerings from Dior, Chanel for its packaging(!). NARS is my favorite brand for pressed powder things. From drugstores, I've been buying quite a lot of L'Oreal stuff, too. As I said earlier, mine is no longer huge (or to think about it, it was never really that big..). What you see in the first pic is pretty much it. 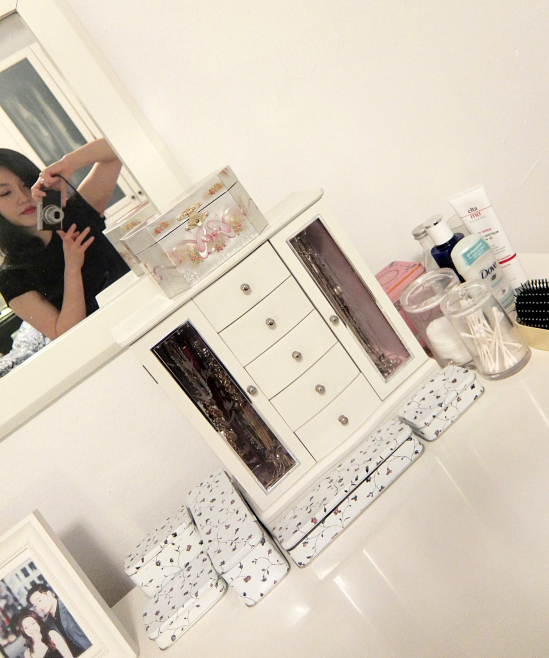 On the other side of my vanity, there is a jewelry chest with a few daily necessities. Plus a couple more drawers for eyeshadows/blushes & nail polishes..
Actually, my vanity is a chest with eight drawers, and I use two small ones for my makeup storage. I inserted these synthetic fabric organizers inside as well. Most people use them for socks and scarves, I know. I have used a revolving makeup storage bought from QVC for years, but I don't think I need it any more. 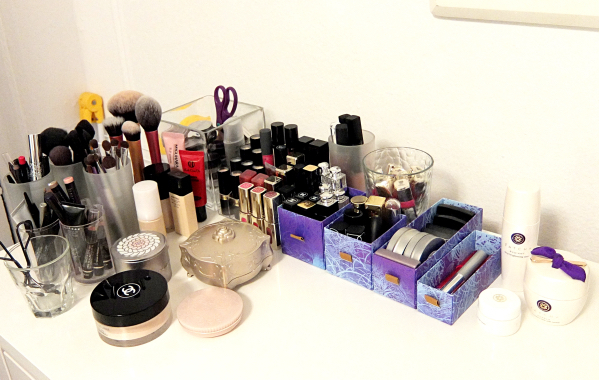 I like using boxes and cups to store my makeup and brushes. 6. How many makeup items have you got in your handbag at the moment? Remember the time we all carried tiny purses? I used to carry a pressed powder and a lip gloss only. Now I bring a little more with me - a pressed powder, a lip gloss, a lipstick, a blush, blotting papers, a perfume vial, a hair tie, a mini eyeliner, an eyeshadow duo, all tucked in my makeup bag. Although I am a big fan of natural looking makeup, the interesting thing is that you do need more products to create the natural effects unless you go natural for real. 9. Have you ever bought any makeup knowing you wouldn't use it? You're all tagged. Feel free! I like the size of your collection! i think it's manageable but with enough options for a beauty blogger. awesome job! Happy New Year Lena! Your stash is quite manageable! I plan on doing major declutter soon too-I'm pretty minimal these days with makeup too, so a lot of it just has to go! In this case, once you get to it, it is already half done. I've realized that I was keeping makeup for emotional reasons, too. It does feel good to have cleaned out some of them! beautiful stash - just enough in my opinion. However I'm guilty of having three number amount of lipsticks so I'm not the right person to judge. It was so fun to read through your answers! destashing is TOTALLY liberating. i would love to pare down my stash but i find it so difficult to give things up. Love the size of your collection :) Mine's a little too huge for me at the moment! I know you have a beautiful & tasteful collection. It would be hard to decide which ones to be purged if I were you! Hey Lena, haaaai it's nice to read a new post from you! So sorry to hear about the hectic work schedule. I hope things will calm down soon. Loved seeing your collection! It looks very reasonable indeed! Lip stuff is also my major weakness (along with my other weaknesses haha). It feels good to blog again. Doing this tag is a nice easy way getting into it. Hopefully, I will post more often. great organization. It is so nice to de-stash your pile once in a while but I always have regrets of throwing things out after a couple of uses. Now I keep the "unwanted" products for at least a few months so when I made my final decision, I could throw them out without looking back. 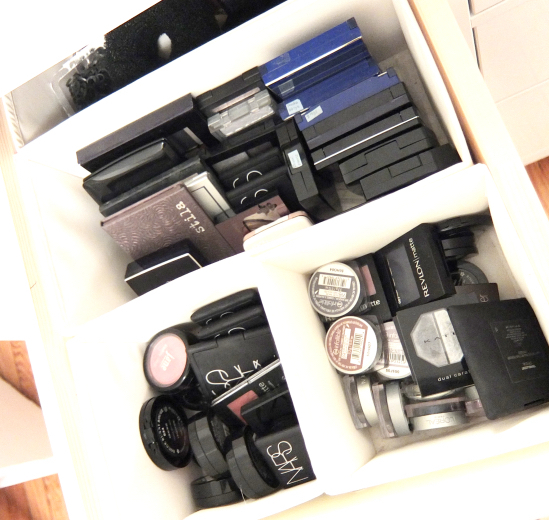 I have also just recently destashed my make up collection, very satisfying xD! Haha, it is actually quite big. I just placed my makeup stuff on the corner. Happy New Year to you Lena! Love this peek at your makeup collection and your storage solutions. You are so well organized with your beauty products. That vanity is a great piece. Now I can better see where my stuff is, and it is actually easy to wear more variety of colors. Before I was just reaching out for the same things often. I like how you use the boxes to organize your vanity! I've thrown some things recently too but begun to regret a couple of the throws a week later haha. I'm going to work on actually buying less this year, as last year I bought way more than I've even had time to open up and swatch. Here's to more "stash-shopping" this year! Great one Lena! I did this tag a few months back! I love how your collection has plenty of Dior and Chanel which I'd love to own more of! I personally can't live without pressed powder! I too have a medium sized collection, all of two shelves and a bit...I totally don't ever want to turn into that make up person with ikea drawers full and full of things they 'rediscover'! 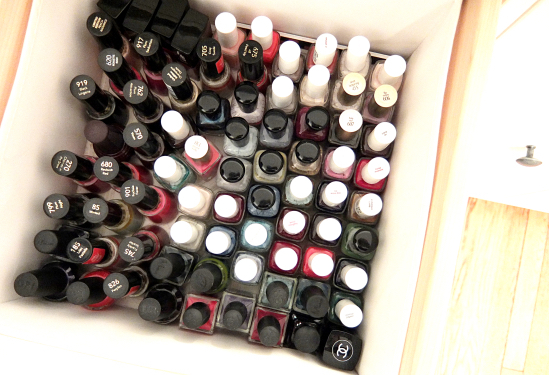 Great to see your collection, you definitely have a ton of nail polishes! I have a lot more eye products! Anyway, I didn't realize you got double tagged but thanks for taking the time out of a busy schedule to do so! I'm impressed with how clean and organized your set-up is. Forget MUJI - jealous of those gorgeous TATCHA boxes! Haha, never! I couldn't. I may not look like an addict anymore, but once an addict, there is no clean recovery from it! Plus I love myself loving makeup (which kind of defines me in a way). Oh I so totally understand what you mean about not wanting to do anything after work! It's been like that for me, too, and it's becoming increasingly difficult and exhausting to write these days, not to mention English is not my first language which makes it even harder! LOL! Still so nice of you to drop by and wrote something for us to read, though! Thanks! It did feel nice to downsize this time. Thanks for doing the tag! :D It's always nice to have a manageable stash that you're satisfied with, I think! Less stress and it all fits in some sort of easy storage, lol. I don't think I would describe myself as an "addict," either...just an enthusiast, lol! It feels kind of amazing(?) to know where exactly my stuff is. I even managed to empty my virtual shopping basket a few times this week as well although I'm happier that I am wanting thing again, which is more healthy in my opinion. I've had many different material loves(? ), but love for makeup is an enduring one. I guess I'm rediscovering things and adapting to my current needs. Jaa has beautiful stuff but I like that she seems to acquire them thoughtfully. I love reading these kinda tags, so interesting! !